Space shuttle Enterprise, seen on the deck of the Intrepid Sea, Air & Space Museum in New York City, before it was covered for display. 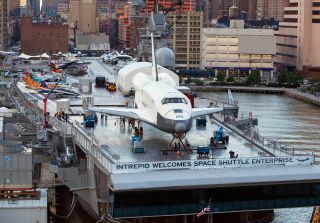 NEW YORK - New Yorkers will have the chance to check out NASA's first space shuttle prototype, the Enterprise, when a brand-new exhibit makes its grand opening on a floating Manhattan museum on Thursday (July 19). The Enterprise shuttle display will be officially unveiled at the Intrepid Sea, Air & Space Museum, which is hosting a string of space-themed events, beginning Thursday and lasting through the weekend, to debut the new Space Shuttle Pavilion on the converted aircraft carrier's flight deck. On Thursday, an opening ceremony will be held at 11 a.m. EDT (1500 GMT) at the Intrepid, which is located at Pier 86 on Manhattan's West Side. NASA chief Charles Bolden will be present at the ceremony to make remarks, museum officials said. Bolden will be joined by Ken Fisher and Bruce Mosler, co-chairmen of the Intrepid, and Susan Marenoff-Zausner, president of the Intrepid. The space shuttle Enterprise never flew in orbit, but was used by NASA for vital approach and landing test flights in the late 1970s. The shuttle prototype paved the way for the agency's prolific space shuttle program, which retired last year after 30 years and 135 missions. NASA awarded Enterprise, which had been on display at the Smithsonian's National Air and Space Museum annex, to the Intrepid in April 2011. The shuttle Discovery, NASA's most-flown shuttle, replaced Enterprise at the Smithsonian annex. Immediately following the ceremony, Intrepid officials will participate in a ribbon cutting in front of the Space Shuttle Pavilion at approximately 12 p.m. EDT (1600 GMT), to mark the official opening of the exhibit to the public. To celebrate the opening of the pavilion, the Intrepid is hosting a festival, called "SAMSUNG SpaceFest," which will run through Sunday (July 22). The event invites the public to experience more than 40 interactive displays, activities and exhibitions, museum officials said. The SAMSUNG SpaceFest activities are free with admission to the Intrepid museum, and are subject to change. A complete schedule of events can be found at www.intrepidmuseum.org. The Intrepid museum is located at Pier 86, at 46th Street and 12th Avenue in Manhattan. SAMSUNG SpaceFest is sponsored by Samsung Smart TV. Time Warner Cable is also an official sponsor of the arrival of Enterprise to the Intrepid Sea, Air and Space Museum. Customers in the New York City area can watch a series of original vignettes about the Enterprise's historic voyage to the Intrepid by tuning to Local On Demand (Channel 1110) under the CAMM tab.